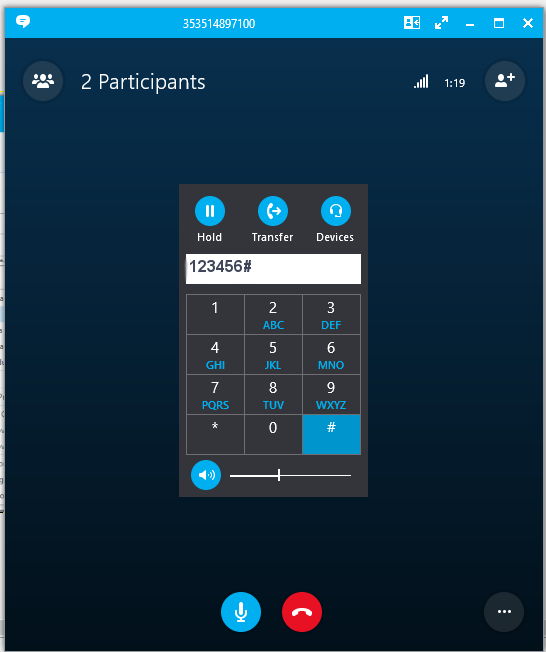 Looking to enable some of your guests to connect with their Skype for Business accounts on your Conference? Follow our guide. 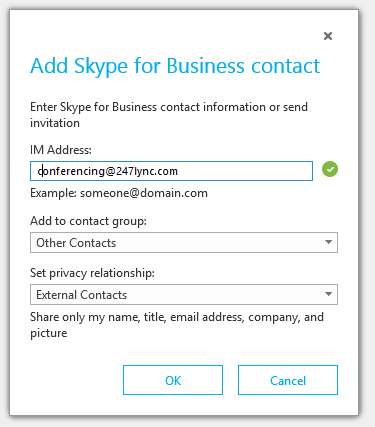 247Lync is our in-house solution enabling customers to connect with both Skype for Business and non-Skype for Business users on Conference. You can find more in-depth information regarding its uses and benefits here. In order to use this solution, you will first need to add the ‘Audio Bridge’ contact to your Skype for Business contacts using the ‘conferencing@247lync.com’ email address. 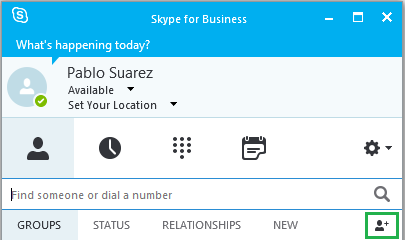 1: Open the Skype for Business App. 2: Locate the Add Contact icon on the right of the app under your user details. 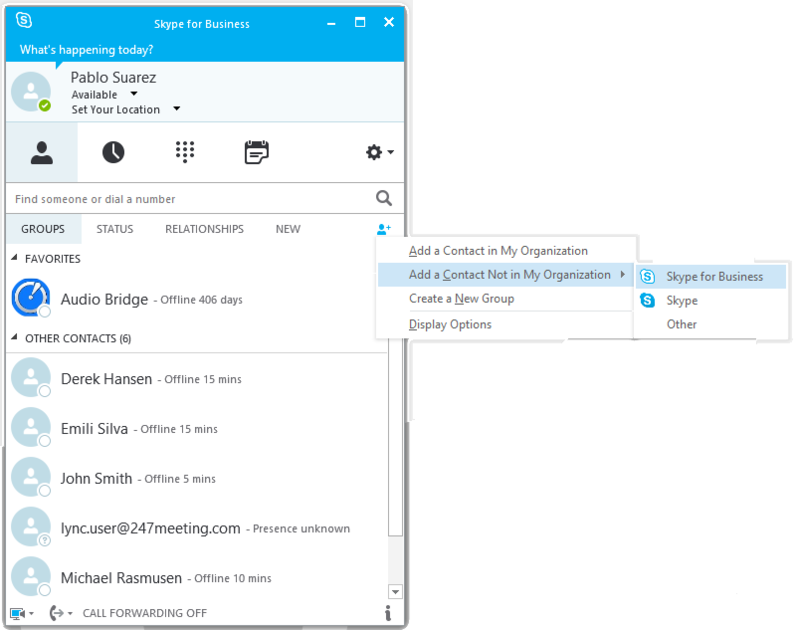 3: When you click on this icon you will see a drop-down menu with the option to ‘Add a Contact Not in My Organization’, which in turn will offer the options ‘SkypeforBusiness’, ‘Skype’ and ‘Other’. 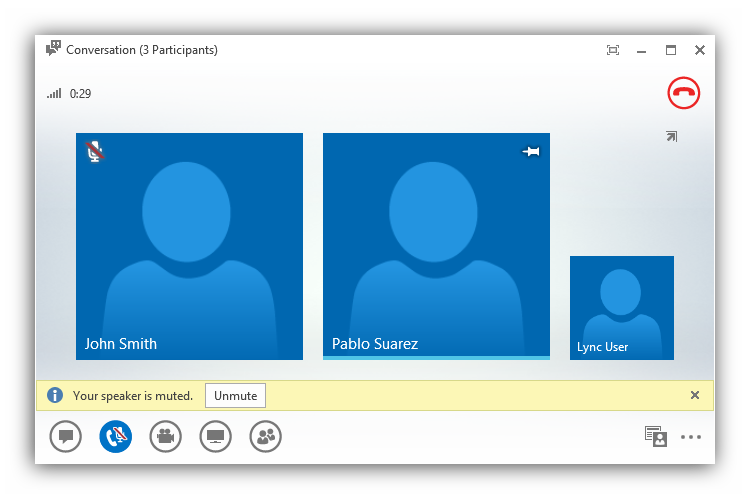 Add ‘conferencing@247lync.com’ as a ‘Lync’ contact. 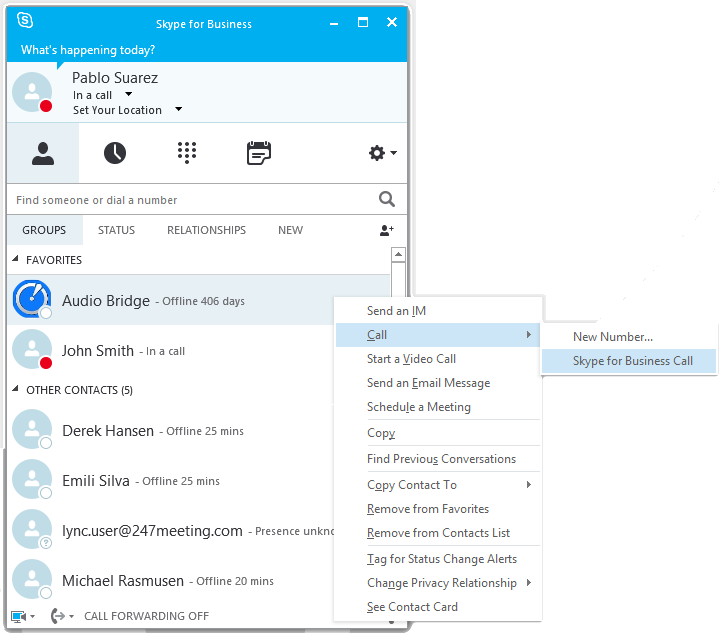 4: The final window for saving the Audio Bridge as a contact to your Skype for Business account will ask you for the contact’s email and privacy settings. The contact is not affected by these settings. You will just need to type in the ‘conferencing@247lync.com’ address and click ‘Ok’. 5: The Audio Bridge will now appear in your contacts, ready for use. 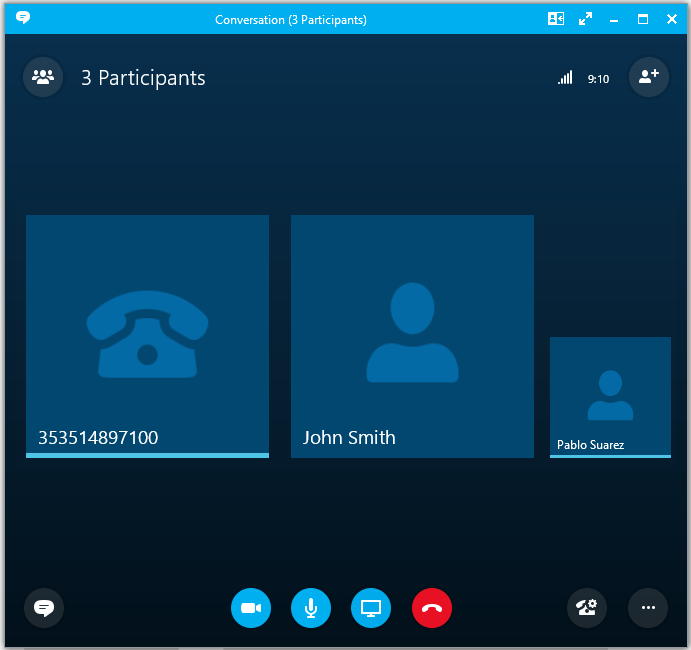 1: Enter a Skype for Business call with your Skype for Business participants. 2: Once your initial call has been established you will need to start another call with the Audio Bridge contact. You can do this by right-clicking on the Audio Bridge Contact and initiating a call. 3: Your call will be connected to our Audio Bridge, and you will need to enter your Host Code. 4: When you have successfully connected to this call, you will need to merge your two ongoing calls so all participants can hear each other and be heard. To do this, locate the ellipsis icon (…) on the bottom right of your second call. 5: When selected the menu will give you the option to ‘Merge This Call Into’. 6: Hover over this option and you will see a list of your ongoing calls. 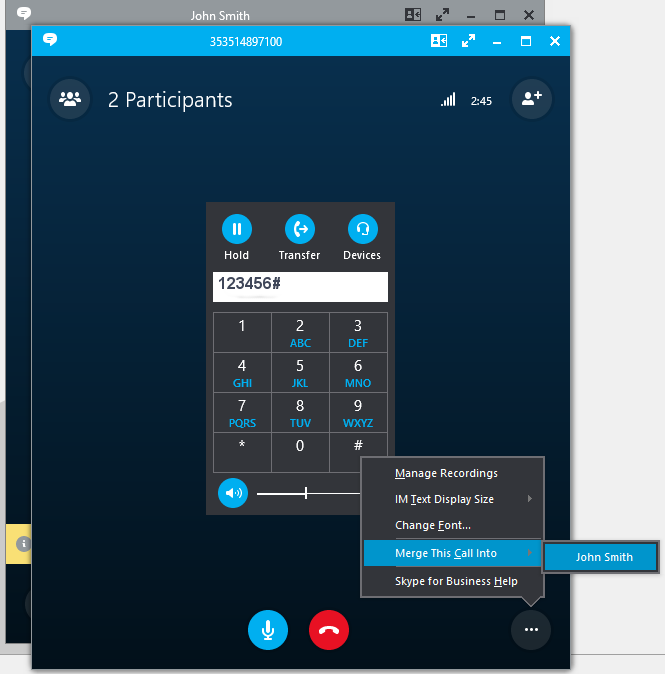 Click on the desired call to merge the calls and complete your conference. I can’t find my PIN codes – is there somewhere I can retrieve them?